The doctor- engineer ratio keeps declining among younger people and falls to 15.7 for the 20-24 year age-group. It is commonly believed that more women opt for medicine while men go for engineering. Economic reforms have been blamed by some critics for widening the gap between the rich and the poor in India. They have also created another divide: between doctors and engineers. According to the 2011 census, India has 35 doctors for every 100 engineers in the 60-plus age-group. The doctor- engineer ratio keeps declining among younger people and falls to 15.7 for the 20-24 year age-group. It is commonly believed that more women opt for medicine while men go for engineering. The data confirms this as the doctor-engineer ratio is higher for women across all age-groups. However, the fall in this ratio from the oldest to youngest age-cohorts has been much sharper among women. Does this mean the post-reform generation has shunned the medical profession for engineering? 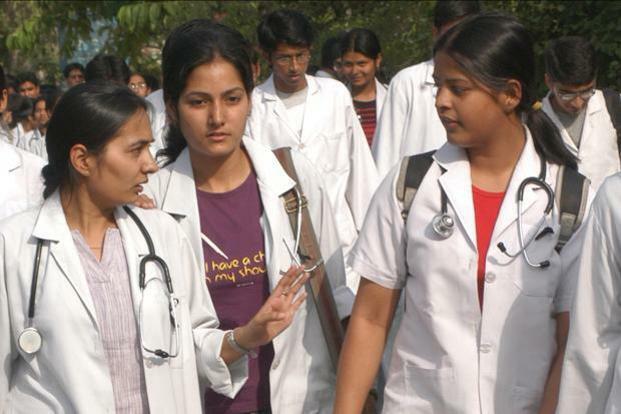 There are currently 28000 seats in government medical colleges in India. According to the AICTE website, the sanctioned intake for under graduate course in government engineering and technology colleges for 2015-16 was 67,571. So, it is more difficult to get into a government medical college than an engineering college. To be sure, one can always get into a private college where capitation fees can be paid to get admission. Even through this route, medical college capitation fees are much higher than for engineering colleges, making it difficult to get admission in the latter. What explains the deterioration in the doctor-engineer ratio? Growth in medical college seats has been a fraction of the growth in the number of engineering college seats. In 1985, 57,888 seats were on offer in engineering colleges in India. By 2016-17, the number had increased almost 27 times to 1,553,711. The 1985 numbers are from a 1989 paper published in the Indian Journal of History of Science, while the 2016-17 numbers are taken from the All India Council for Technical Education’s website. Contrast this with the number of seats in medical colleges. They have risen less than three times from 19,745 in 1985 to 52,205 by 2016, shows data available on the Medical Council of India (MCI) website. To put it differently, India added more than 48,000 seats per year to its engineering colleges in these 31 years. For medical colleges, the increase was just above 1,000 per year. In fact, the medical college seats available in India have only increased by 14 times since independence. India’s scarcity of doctors is a big problem. The World Health Organisation (WHO) recommends one doctor per thousand people in a country. The latest figures for India are below this benchmark, and much behind that for countries such as China and Brazil. The rapid growth in the number of engineering graduates suggests that India should be ahead of its peers in cutting edge research in technology. Even that does not seem to be true. World Bank data suggests that India’s progress in increasing the number of researchers (in R&D) has been insignificant compared to that made by China and Brazil. These findings seem to be in keeping with many surveys which describe the bulk of Indian engineers as unemployable. The PG Times reported in January 2016 that more than 80% of Indian engineers remained unemployable. These figures also underline the challenge of maintaining even a minimum standard of education with increasing privatisation. The Medical Council of India (MCI) has been accused of being miserly in granting affiliation to medical colleges; yet, it is scary even to contemplate what the situation may have been in the event of a rapid increase in the number of medical schools, were it to produce results similar to that in engineering. To be sure, a check on increasing private medical colleges has not helped us create a commendable medical education set-up. A Reuters report published last year exposed fraudulent practices in India’s private medical colleges. A Washington Post story published by NDTV showed that more than half of India’s medical schools had not produced a peer-reviewed research paper in a decade. The government think tank NITI Aayog recently released a draft bill to overhaul the state of medical education in the country. The bill calls for radical reforms including scrapping of the MCI, allowing for-profit medical colleges after doing away with capitation and other hidden fees, and tapping the pool of qualified doctors to meet a shortage of faculty . While there is bound to be a debate on the effectiveness of such regulation in ensuring quality private medical education, there can be little argument over the fact that all such strategies should ultimately keep in mind the inability of a majority of poor people to pay for healthcare.